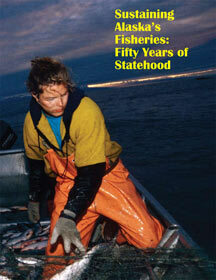 Sustaining Alaska’s Fisheries: Fifty Years of Statehood was created by ADF&G as part of Alaska’s 2009 Statehood Celebration. This engaging story of our commercial fishery management heritage was written by Bob King, writer, former fisheries industry journalist, and former press secretary to an Alaska governor. The publication was designed by Amy Carroll, ADF&G Publications Specialist, and funded with a grant from the Alaska Fisheries Marketing Board. We hope you enjoy this 74-page pictorial retrospective. It is filled with the stories of visionary pioneers, scientists, and the adventurous and courageous leaders who have been a part of developing Alaska’s sustainable commercial fisheries management principals, recognized today as some of the best in the world.